For other usages, see Serapis (disambiguation). Serapis (Koinē Greek: Σέραπις, later form) or Sarapis (Σάραπις, earlier form, from Coptic: ⲟⲩⲥⲉⲣϩⲁⲡⲓ Userhapi "Osiris-Apis") is a Graeco-Egyptian deity. 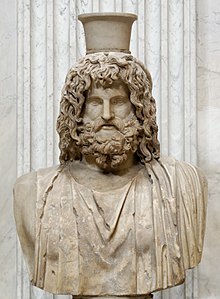 The cult of Serapis was introduced during the third century BC on the orders of Pharaoh Ptolemy I Soter of the Ptolemaic Kingdom as a means to unify the Greeks and Egyptians in his realm. A serapeum (Koinē Greek: Σεραπεῖον serapeion) was any temple or religious precinct devoted to Serapis. The cultus of Serapis was spread as a matter of deliberate policy by the Ptolemaic kings, who also built the immense Serapeum of Alexandria. Serapis continued to increase in popularity during the Roman Empire, often replacing Osiris as the consort of Isis in temples outside Egypt. Serapis was depicted as Greek in appearance but with Egyptian trappings, and combined iconography from a great many cults, signifying both abundance and resurrection. Though Ptolemy I may have created the official cult of Serapis and endorsed him as a patron of the Ptolemaic dynasty and Alexandria, Serapis was a syncretistic deity derived from the worship of the Egyptian Osiris and Apis and also gained attributes from other deities, such as chthonic powers linked to the Greek Hades and Demeter, and benevolence linked to Dionysus. There is evidence that the cult of Serapis existed before the Ptolemies came to power in Alexandria: a temple of Serapis in Egypt is mentioned in 323 BC by both Plutarch (Life of Alexander, 76) and Arrian (Anabasis, VII, 26, 2). The common assertion that Ptolemy "created" the deity is derived from sources which describe him erecting a statue of Serapis in Alexandria: this statue enriched the texture of the Serapis conception by portraying him in both Egyptian and Greek style. In 389, a Christian mob led by Pope Theophilus of Alexandria destroyed the Serapeum of Alexandria, but the cult survived until all forms of pagan religion were suppressed under Theodosius I in 391. This pendant bearing Serapis's likeness would have been worn by a member of elite Egyptian society. Walters Art Museum, Baltimore. "Sarapis" was the most common form in Ancient Greek until Roman times, when "Serapis" became common. The most renowned serapeum was in Alexandria. Under Ptolemy I Soter, efforts were made to integrate Egyptian religion with that of their Hellenic rulers. Ptolemy's policy was to find a deity that should win the reverence alike of both groups, despite the curses of the Egyptian priests against the gods of the previous foreign rulers (e.g. Set, who was lauded by the Hyksos). Alexander the Great had attempted to use Amun for this purpose, but he was more prominent in Upper Egypt, and not as popular in Lower Egypt, where the Greeks had stronger influence. The Greeks had little respect for animal-headed figures, and so a Greek-style anthropomorphic statue was chosen as the idol, and proclaimed as the equivalent of the highly popular Apis. It was named Userhapi (i.e. "Osiris-Apis"), which became Greek Sarapis, and was said to be Osiris in full, rather than just his ka (life force). The earliest mention of a Sarapis occurs in the disputed death scene of Alexander (323 BC). Here, Sarapis has a temple at Babylon, and is of such importance that he alone is named as being consulted on behalf of the dying king. The presence of Sarapis in Babylon would radically alter perceptions of the mythologies of this era: the unconnected Babylonian god Ea (Enki) was titled Shar Apsi, meaning "king of the Apsu" or "the watery deep", and perhaps he is the one meant in the diaries. His significance in the Hellenic psyche, due to its involvement in Alexander's death, may have also contributed to the choice of Osiris-Apis as the chief Ptolemaic god. According to Plutarch, Ptolemy stole the cult statue from Sinope in Asia Minor, having been instructed in a dream by the "unknown god" to bring the statue to Alexandria, where the statue was pronounced to be Sarapis by two religious experts. One of the experts was of the Eumolpidae, the ancient family from whose members the hierophant of the Eleusinian Mysteries had been chosen since before history, and the other was the scholarly Egyptian priest Manetho, which gave weight to the judgement both for the Egyptians and the Greeks. Plutarch may not be correct, however, as some Egyptologists allege that the "Sinope" in the tale is really the hill of Sinopeion, a name given to the site of the already existing Serapeum at Memphis. Also, according to Tacitus, Serapis (i.e., Apis explicitly identified as Osiris in full) had been the god of the village of Rhakotis before it expanded into the great capital of Alexandria. The statue suitably depicted a figure resembling Hades or Pluto, both being kings of the Greek underworld, and was shown enthroned with the modius, a basket/grain-measure, on his head, since it was a Greek symbol for the land of the dead. He also held a sceptre in his hand indicating his rulership, with Cerberus, gatekeeper of the underworld, resting at his feet. The statue also had what appeared to be a serpent at its base, fitting the Egyptian symbol of rulership, the uraeus. With his (i.e. Osiris's) wife Isis, and their son Horus (in the form of Harpocrates), Serapis won an important place in the Greek world. In his 2nd-century AD Description of Greece, Pausanias notes two Serapeia on the slopes of Acrocorinth, above the rebuilt Roman city of Corinth and one at Copae in Boeotia. Serapis figured among the international deities whose cult was received and disseminated throughout the Roman Empire, with Anubis sometimes identified with Cerberus. At Rome, Serapis was worshiped in the Iseum Campense, the sanctuary of Isis built during the Second Triumvirate in the Campus Martius. The Roman cults of Isis and Serapis gained in popularity late in the 1st century when Vespasian experienced events he attributed to their miraculous agency while he was in Alexandria, where he stayed before returning to Rome as emperor in 70. From the Flavian Dynasty on, Serapis was one of the deities who might appear on imperial coinage with the reigning emperor. The main cult at Alexandria survived until the late 4th century, when a Christian mob destroyed the Serapeum of Alexandria in 385. The Theodosian decree of 380 implicitly included the cult in its general proscription of religions other than approved forms of Nicene Christianity. ^ "Sarapis" in The New Encyclopædia Britannica. Chicago: Encyclopædia Britannica, Inc., 15th edn., 1992, Vol. 10, p. 447. ^ Youtie, H. 1948. “The Kline of Serapis”. The Harvard Theological Review, vol 41, pp. 9–29. ^ Stambaugh, John E. (1972). Sarapis Under the Early Ptolemies. Leiden: E. J. Brill. pp. 1–13. ^ Consulting the unabridged Lewis and Short Latin lexicon shows that "Serapis" was the most common Latin version of the name in antiquity: Serapis. Charlton T. Lewis and Charles Short. A Latin Dictionary on Perseus Project. Lewis, Charlton; Short, Charles (1879). A Latin Dictionary. Oxford: Oxford University Press. p. 1630. A Latin Dictionary. p. 1678. On the Internet Archive. ^ E.g. CIL 03, 07768; CIL 03, 07770; CIL 08, 12492. All known occurrences can be found at http://db.edcs.eu/epigr/epi.php?s_sprache=de. ^ "Of the Egyptian sanctuaries of Serapis the most famous is at Alexandria", Pausanias noted (Description of Greece, 1.18.4, 2nd century AD), in describing the Serapeion at Athens erected by Ptolemy on the steep slope of the Acropolis: "As you descend from here to the lower part of the city, is a sanctuary of Serapis, whose worship the Athenians introduced from Ptolemy." ^ According to Sir J.G. Frazer's note to the Biblioteca of Pseudo-Apollodorus, 2.1.1: "Apollodorus identifies the Argive Apis with the Egyptian bull Apis, who was in turn identified with Serapis (Sarapis)"; Pausanias also conflates Serapis and Egyptian Apis: "Of the Egyptian sanctuaries of Serapis the most famous is at Alexandria, the oldest at Memphis. Into this neither stranger nor priest may enter, until they bury Apis" (Pausanias,Description of Greece, 1.18.4). ^ Reported from Arrian, Anabasis, VII. 26. ^ Pausanias 2.4.5 and 9.24.1. Borgeaud, Philippe; Volokhine, Yuri (2000). "La formation de la légende de Sarapis: une approche transculturelle". Archiv für Religionsgeschichte (in French). 2 (1). Bricault, Laurent, ed. (2000). De Memphis à Rome: Actes du Ier Colloque international sur les études isiaques, Poitiers – Futuroscope, 8–10 avril 1999. Brill. ISBN 9789004117365. Bricault, Laurent (2001). Altas de la diffusion des cultes isiaques (in French). Diffusion de Boccard. ISBN 978-2-87754-123-7. Bricault, Laurent, ed. (2003). Isis en Occident: Actes du IIème Colloque international sur les études isiaques, Lyon III 16-17 mai 2002. Brill. ISBN 9789004132634. Bricault, Laurent (2005). Recueil des inscriptions concernant les cultes isiaques (RICIS) (in French). Diffusion de Boccard. ISBN 978-2-87754-156-5. Bricault, Laurent; Veymiers, Richard, eds. (2008–2014). Bibliotheca Isiaca. Editions Ausonius. Vol. I: ISBN 978-2-910023-99-7; Vol. II: ISBN 978-2-356-13053-2; Vol. III: ISBN 978-2-356-13121-8. Bricault, Laurent; Versluys, Miguel John; Meyboom, Paul G. P., eds. (2007). Nile into Tiber: Egypt in the Roman World. Proceedings of the IIIrd International Conference of Isis Studies, Faculty of Archaeology, Leiden University, May 11–14 2005. Brill. ISBN 978-90-04-15420-9. Bricault, Laurent (2013). Les Cultes Isiaques Dans Le Monde Gréco-romain (in French). Les Belles Lettres. ISBN 978-2251339696. Bricault, Laurent; Versluys, Miguel John, eds. (2014). Power, Politics and the Cults of Isis: Proceedings of the Vth International Conference of Isis Studies, Boulogne-sur-Mer, October 13–15, 2011. Brill. ISBN 978-90-04-27718-2. Hornbostel, Wilhelm (1973). Sarapis: Studien für Überlieferungsgeschichte, des Erscheinungsformen und Wandlungen der Gestalt eines Gottes (in German). E. J. Brill. ISBN 9789004036543. Merkelbach, Reinhold (1995). Isis regina—Zeus Sarapis. Die griechisch-aegyptische Religion nach den Quellen dargestellt (in German). B. G. Teubner. ISBN 978-3-519-07427-4. Pfeiffer, Stefan (2008). "The God Serapis, his Cult and the Beginnings of the Ruler Cult in Ptolemaic Egypt". In McKechnie, Paul; Guillaume, Philippe. Ptolemy II Philadelphus and his World. Brill. ISBN 978-90-04-17089-6. Takács, Sarolta A. (1995). Isis and Sarapis in the Roman World. E. J. Brill. ISBN 978-90-04-10121-0. Tallet, Gaëlle (2011). "Zeus Hélios Megas Sarapis: un dieu égyptien 'pour les Romains'?". In Belayche, Nicole; Dubois, Jean-Daniel. L'oiseau et le poisson: cohabitations religieuses dans les mondes grec et romain. PUPS. ISBN 9782840508007. Thompson, Dorothy J. (2012). Memphis Under the Ptolemies, Second Edition. Princeton University Press. ISBN 978-0-691-15217-2. Vidman, Ladislav (1970). Isis und Serapis bei den Griechen und Römern (in German). Walter de Gruyter. ISBN 978-3111768236. Wikimedia Commons has media related to Serapis. "Greco-Egyptian Mythology: The Alexandrian Synthesis"